The Cellular Electricity Power IoT RTU is special designed for IOT Based Real Time Distribution Transformer Monitoring System(DTMS) and Electricity power monitoring system using Internet of Things (IoT), all monitoring parameters are processed and if any abnormality occurs, e.g. : overload or loss phase or exceed the pre-set value, it will alert by SMS, Voice call, Cloud, APP, Web Server, SCADA, HMI, DSC and recorded in system memory immediately. 400VAC of 3-Phase electricity power distribution safety and measurement, can measuring the 3-phase 3-wire, 3-phase 4-wire distribution power voltage, current, factor, watts, frequency, apparent power, active power, reactive power, active energy, reactive energy. Also, it provides Dual SIM, 2 digital inputs, 2 relay outputs, 1 ambient sensor input for monitoring onsite temperature and humidity, also 1 RS485 for extend I/O to monitoring oil level and temperature or read meters. The Cellular Electricity Power IoT RTU inbuilt industrial Cellular module(GSM/GPRS/3G/4G). It provides 1 RJ45 Ethernet port for connecting the internet over cables. The Cellular Electricity Power IoT RTU also can monitoring and operates the I/O ports by SMS, APP, Web Server, internet, timers and programmed inter-lock events automatically. 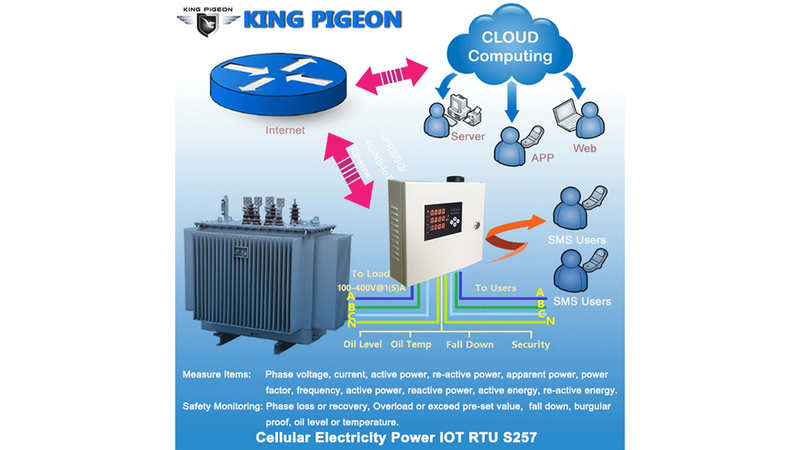 The Cellular Electricity Power IoT RTU can be easily to operate by the provided cloud, app, and web server, or integrated to you IoT applications according to the TCP/UDP protocol, or integrated to SCADA systems by standard Modbus TCP protocol, too. This is very useful if you need remote control onsite devices with low cost solution.